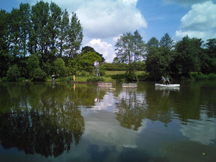 If you visit Shepherds Way, you will see that the Club has introduced 2 floating Islands. These have been supplied by the Environment Agency at no cost to the Club whatsoever and our thanks must be passed on to (Rob Pearson EA Officer) and his team for their assistance in getting them onto the lake. The reason for introducing them is to allow some refuge for fish against predatation from Cormorant’s. Many of you will be aware that we have applied for a licence to cull and by introducing these we hope to strengthen our application to Natural England, especially as the problem is still ongoing and we are losing fish. 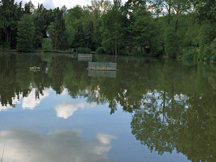 The Islands have a cage underneath them but it does not go to the lake bed and this allows larger fish access from underneath and smaller fish through the wires. 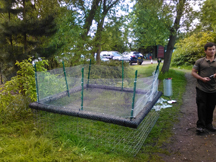 They are anchored to the bottom via two ropes with heavy weights attached and have coconut matting with grass and aquatic seed that will hopefully grow up enhancing their appearance, the chicken wire is to prevent birds nesting. We strongly recommend that you do not cast directly to the islands as you are likely to get snagged. We would like to thank you in advance for your cooperation in this matter.